Protect yourself from bed bugs all night with the NiteSafe ® Sleep System from Mattress Safe®. NiteSafe® offers you protection from bed bugs during an infestation and throughout a treatment program. NiteSafe® is constructed of certified materials that bed bugs cannot enter or bite through. Together with a bed bug certified zipper enclosure, our specialized design ensures complete protection throughout the night. NiteSafe® should be used in conjunction with Mattress Safe® bed bug certified mattress and box spring encasements. By following NiteSafe® usage instructions in conjunction with proper pest management protocol, NiteSafe® will increase your security for a bite free night. 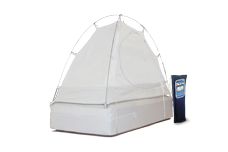 Mattress Safe® cannot guarantee a 100% bed bug free environment. NiteSafe® may be laundered or tumbled in the dryer each morning to ensure that it is bed bug free and ready for the next good night’s sleep. Give Yourself a Safe Night’s Sleep with NiteSafe®!